Right is right, even if everyone is against it, and wrong is wrong, even if everyone is for it." - William Penn. We are always taught that to do certain things is right and to do otherwise is wrong. I was blessed with an aunt, who always first told me 'What was the right thing to do' and also she instilled in me an independent thought process so that I could differentiate between Right and Wrong on my own. She always said you could advise a child only till they attain a certain age(may be 12 or 14 years) and after that He/she, will most of time stop taking advice. I have noticed Right is subjected to many factors like our own experience, our surroundings, our age, our education and so on. Something I considered Wrong many years back, seems Right today ! Right and Wrong can also change with point of reference. My right, is totally wrong for you. What you consider right, is wrong in my opinion. What seems right for both of us, is absolutely wrong to a third person. For me there was a phase where the thin line between right and wrong ceased to exist. These days the above quote has been changed, "Right is WRONG, when everyone is against it, and even wrong becomes RIGHT, if everyone is for it." the last paragraph rings with truth! happens most of the time dat right is buried and forgotten as majority is with the wrong! Shakespeare put good / bad into perspective when he said "There is nothing either good or bad, only thinking makes it so". Could well apply to right and wrong as well. I am always in dilemma when I have to decide what is right and what is wrong. At least two sides to a story always. But then, certain wrongs can never be right and vice versa. Beautifully written.Right or wrong is never absolute and relative to time,circumstances,country,culture and even one's status.Truth is always right but in certain situations can harm innocent.Your article set me thinking. True for today no doubt. The demarcation between right and wrong had become so muddy now. But majority can be wrong sometimes, Ananya! One look at the politics will tell you that ;) Seriously though, it is indeed a very murky line between right and wrong. And yet at times there isn't that line, things can be crystal clear. If only we know how to listen to that inmost voice from within. Good post! Right or wrong are relative things and both are dependent variables related to several independent variables and parameters. To optimize the constraints requires a trick and a presence of mind and King Solomon type judgement. Right and wrong are both very relative terms, and I also believe that what's right today may be wrong tomorrow and vice versa, it's really hard to categorize.. The problem comes with Mr./Ms. I-am-always-right who would not want to see others point of view. I totally can't stand such people. I agree, in most cases majority wins, even if they are wrong but I also believe that everything is not right and wrong. And that rights can be different for different people. Especially as a parent I have noticed this, not everyone may think or act like me but that doesn't make them wrong. Everything has a reason which can make it right or wrong. It is all relative! Agree ,what is right today may become wrong at a different time,place,context,etal.Superb post ! Correct or wrong, good or bad, etc. depends on the situation. Of course, there are situations in which there cannot be two opinions. In such situations, we must remember Gandhi's words: "Even if you are a minority of one, the truth is the truth." The reason we keep changing our perception about right and wrong is due to our experiences. Most often, when we take a strong stand, it is because we believe that, in our hearts, it is right for us to do so. As long as you are not affected by the guilt, then you can stand tall and firm. right is nothing what you believe is the only right thing ! 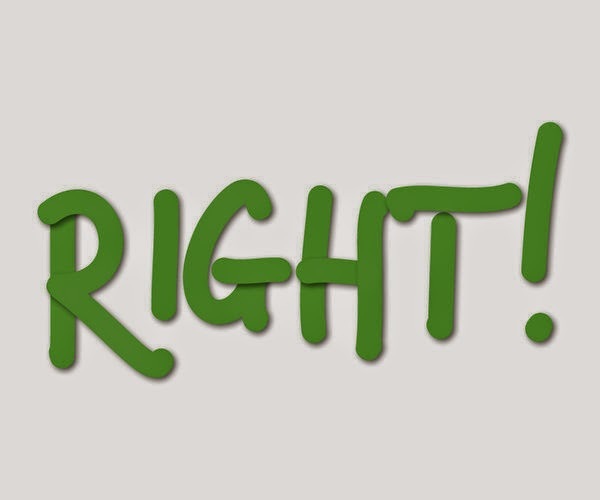 I think right or wrong is related to one;s perspective and that depends on how one is brought up. This reminds me of the argument that was going on a forum where everyone was discussing about gays and bisexuals. Some thought it was ok and gays needs to be accepted into the society where as some thought it was absolutely abnormal and wrong. Yes Ananya these days the right is easily converted into wrong and also the the other way round. Hahaha indeed. It is all about the majority these days. More so because, honesty is no longer the best policy! What is morally right will always be right. True that experiences and circumstances change quite a lot, but ones value system and conscience is the best judge for right or wrong! we are mostly all grey, not black or white. True. Agree Ananya, Right is Right and Wrong is Wrong, no matter who are doing it. I agree it's a tough call to adhere by ethics but at least, we will sleep with a good conscience and be true to the self. Well written post and very much agreeable!! Sigh. With mob mentality. Wrong becomes a right. Very thought-provoking, particularly the way you rephrased the original quote! I believe right and wrong are just perception. What is wrong to us maybe right to others. It's the fine balance of ideals that one must seek to actually judge something as right or wrong. Right and wrong have to co-exist in this society. Just like Heads and tails of the coin. Without Bad, there cannot be any Good just like without villain there cannot be a Hero. The balance needs to be maintained though. Cos we know the value of Passing an exam when we see someone Failing it. Right Ya Wrong is all based on perspectives!